The wedding cake has remained an important part of the matrimonial tradition for centuries. In fact, it is the centerpiece of your wedding reception. The wedding cake is one of the very first things that your royal guests will immediately notice as soon as they arrive at your wedding venue. Obviously, the first glimpse of your well-decorated wedding cake is a beautiful and dramatic moment. It is the accurate reflection of your individual taste and style. So, do you want to capture the pictures of your wedding cake as a part of your wedding photo shoot? Well, if yes, then you are recommended to hire a competent, experienced, and well-versed custom cake photographer who will precisely capture wedding cake photographs. 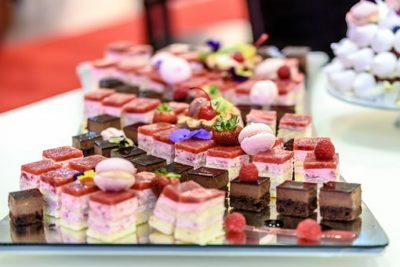 Now, check out the following sections and reveal how a professional custom cake photographer will help you create unique wedding cake photography. To capture amazing professional looking photos of your wedding cake, the professional photographers mainly use a long lens. A long lens will reduce or remove the blurry portions of the background. This will eventually put more focus on the cake itself. Also note, a long lens will help them capture the accurate proportions of your wedding cake, whereas a wide lens can simply distort the view. Custom cake photographers tend to use natural lights for shooting wedding cake photography. Ideally, your wedding cake should be placed in such a location where a plenty of natural lights are available. The photographers may position themselves at a 90-degree angle to the actual source of the natural light in order to capture the best shots. Needless to mention, capturing memorable and unique wedding cake photographs is all about setting the right angle of the camera. Depending on the shape, size, and height of your wedding cake, there’ll be certain angles which will definitely look better than others. And, a proficient professional wedding photographer possesses the adequate experience and expertise to find the best angle for excellent and unique wedding cake photography. Interesting accessories like flowers, champagne flutes, or cutting utensils that are surrounding the wedding cake will add more value to your cake photography. A cake photographer with his/her comprehensive experience and expertise will document these accessories in a precise and minute way and offer you a maximum visual variety. The aforementioned reasons certainly reveal how a custom cake photographer in Houston TX can capture unique and memorable wedding cake photographs. Three Brothers Bakery is a longstanding family bakery (from 1949) specializing in custom cakes, pecan pies & many other sweets. To learn more about Three Brothers Bakery, visit their website at 3brothersbakery.com.